Having peer developers review code before changes are submitted and integrated to the main codebase can be beneficial for a number of reasons: First, code reviewing helps to improve software quality, as the additional attention of peers can help to detect errors, improve readability of the code, or even help with design decisions. Second, code reviewing also helps to disseminate knowledge between team members or even across different teams or organizations. Teams that are committed to code review are also quickly aware of its main drawback: Code reviewing takes time – a lot of time. On average, developers spend about six hours per week preparing code for review or reviewing others’ code. Therefore, increasing the effectiveness of code review practices is beneficial for ensuring developers’ time is spent wisely. Here is what we found out during a large-scale study at Microsoft . The main building blocks of code reviews are comments that reviewers add as feedback and suggestions for change that the code review author can address. The usefulness of those comments highly influence the effectiveness of the code review practices. What are useful code review comments? As the primary goal of code review is to ensure that a change is free from defects, follows team conventions, solves a problem in a reasonable way, and is of high quality , we consider review feedback useful if it is judged useful by the author of the change to enable him or her to meet these goals. Identification of any functional issues. However, most of the review comments are unrelated to any types of functional defects. Pointing out missing validation checks or alternate scenarios (including corner cases) where the current implementation may fail. Suggestions regarding APIs to use, designs to follow, coding patterns, team coding conventions or best practices. “nit-picking issues” (e.g., indentation, comments, style, identifier naming, and typos). Resolution of nit-picking issues helps long-term project maintenance. Feedback / questions to help authors to think about an alternate implementation or a way to refactor the code to make it more comprehensible (even if the current implementation may be correct). Asking questions merely to understand the implementation. Those comments may be useful to the reviewers, but are not considered useful by the author as they do not improve the code. Praising code segments. Those comments may help building positive impressions between the team members, and encourage good coding, but interviewees rated those as ‘Not useful’. Pointing out future work, not planned for the current development cycle, or comments about code that was not related to the change at all, but simply existed in the changed files. To understand which issues are raised and how useful those are during code reviewing, we had developers classify review comments, see Figure 1. In general, interviewees rated almost 69% comments as either useful or somewhat useful. 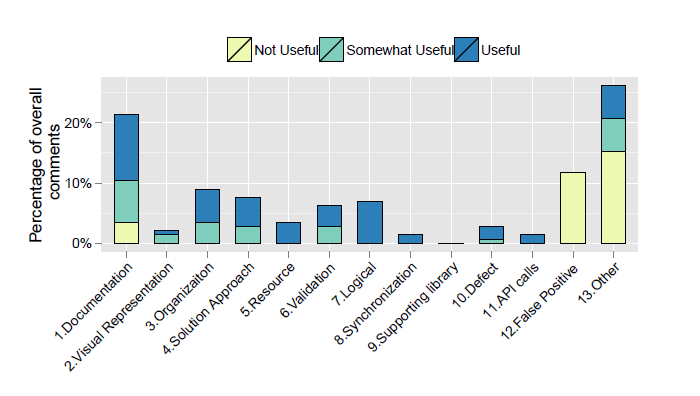 Most of the comments identifying functional defects were rated as “Useful” (categories from 5 to 11 in Figure 1). More than 60% of the “Somewhat Useful” comments belong to documentation in the code, visual representation of the code (e.g. blank lines, indentation), organization of the code (e.g. how functionality is divided into methods), and solution approach. These four all belong to so called “evolvability defects”, i.e., issues that affect future development effort rather runtime behavior . Reviewers who have either changed or reviewed an artifact before give more useful comments than reviewers unexperienced with that piece of code. Interestingly, to be able to give more useful comments, it is enough to have changed that code once, i.e., developers who had changed a file ten times had the same usefulness density as developers how had only changed a file once. If developers have not edited that piece of code, it takes them about five reviews to get to their full potential. Reviewers that have spent more time in the organization contribute a higher density of useful comments. The effect is especially visible for new hires, who in the first three months had the lowest density of useful comments. During the first year, the usefulness density increases the most, and stays relatively stable afterwards. At Microsoft, the first year is often considered “ramp up” time for the new hires. During that time employees become more familiar with the code review process, project design, and coding practices at Microsoft. After the ramp up period, they can be as useful reviewers as their senior Microsoft peers. Although most comments come from team members, cross-team reviewers are often picked because of their expertise in a specific area. Reviewers from different teams give slightly more useful comments than reviewers from the same team. This outside perspective helps to spot issues the team did not focus on. As the number of files affected by the change increases, the density of useful comments drops. Reviewing larger changes is more complicated, takes more time and effort, and is often less thoroughly done. Ideally, reviews should contain small, incremental and complete changesets. It is harder for reviewers to give useful comments on non-code files. Especially configuration and build files have a low proportion of useful comments. We expect that this may be due to the complexity of those files. For more information on this subject please have a look at the related technical report. Url:  A. Bacchelli and C. Bird, “Expectations, outcomes, and challenges of modern code review,” in Proceedings of the 2013 International Conference on Software Engineering. IEEE Press, 2013, pp. 712–721. M. Mantyla and C. Lassenius, “What types of defects are really discovered in code reviews?” Software Engineering, IEEE Transactions on, vol. 35, no. 3, pp. 430–448, May 2009. Michaela works as a software engineer and researcher at Microsoft. She supports product teams including Office, Windows, Exchange to optimize their software development processes. She especially focuses on optimizing effectiveness of company-wide testing and code reviewing activities.